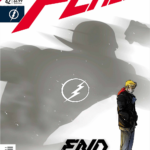 DC has posted the five-page preview for this week’s issue of The Flash, and you can read it at The Beat. In it, Grodd finds something strangely familiar about Wally West as his health continues to deteriorate. This entry was posted in Flash News and tagged previews on March 13, 2018 by Lia.